Fathers get gypped in the celebration department since by the time Father's Day comes schools are mostly out and we are into summer. But we celebrated fathers today at the library. 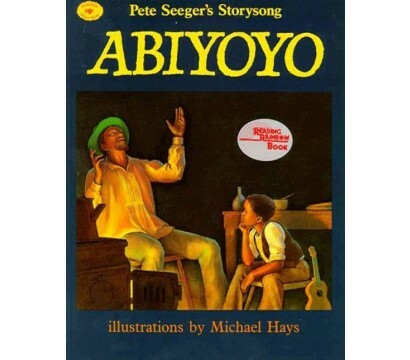 I grew up listening to Pete Seeger and this "Storysong" is one of the first stories I ever told as a librarian. It's still a favorite of mine to tell and one of these days I intend to get a ukelele and learn to strum a few chords. It's a very physical story--by the end of it I am almost as tired as Abiyoyo was right before he fell down on the ground! The story of the coat that becomes a jacket that becomes a vest, etc, etc, until there is nothing left but a story is a classic Jewish folk tale. 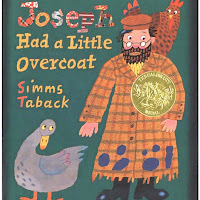 There are several other versions besides Simms Taback's Joseph Had A Little Overcoat, but his is likely to be found in most libraries because of that gold medal on the cover. And for once, the Caldecott Medal went to a deserving book--Taback is a truly creative artist. I turned this into a "Grandpa" story, making the protagonist my own Grandpa Aaron (who really worked in the "gammint" trade) with my uncles and my father as the recipients of the repurposed coat, and ending with the story which my father gave to me. And I did it as a cut and tell story. It's pretty easy to fold a sheet of paper and make a basic coat, then cut it down into the other shapes, though next time I do it I may have my husband draw pencil lines to guide me--I am NOT a skilled cutter! I went on YouTube to see if I could find the song that goes with this and found aWeston Woods video with the first part of the song. So here it is. 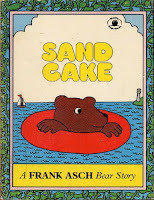 Sadly Frank Asch's lovely book Sand Cake is out of print, but happily if you go to his web site you can see it as an animated book, narrated by Asch himself. 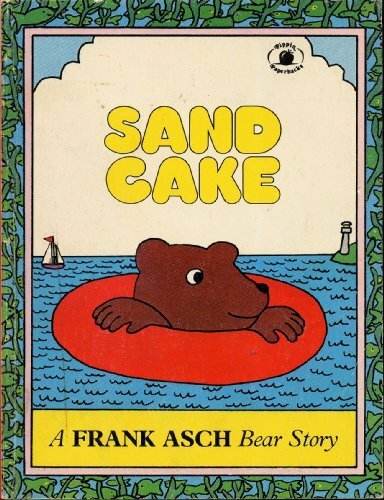 It's a wonderful funny story in which Little Bear promises to eat a cake Papa Bear makes at the beach, and then has to figure out how to eat a "cake" made of sand eggs, milk and wheat! To tell it I found some black and white outline drawings of a cow, chicken, oven and bear. I taped the pages, black line side down onto some big easel paper. And then I used a black marker to redraw the lines as I told the story. If you're more talented, you could free hand draw this, but again, I can't draw, so I did this for everything but the wheat--just some long lines with "v"s across the tops! I used another Pete Seeger song "All Around the Kitchen", just because it went with "Abiyoyo" and it's loads of fun for the kids to dance to.Click here for a sound clip. "Down on Grandpa's Farm" is a standard song at Mother Goose Time, so lots of the bigger kids knew it. At Mother Goose Time, I only do a few verses, but for this program I pulled out my whole basket of farm animal puppets and we did just about all of them. If you don't know this song, there is a great clip on Amazon.com of Raffi singing this song --it's from his album "One Light, One Sun". Important Note:This song does not come from the show featuring the Purple Dinosaur Who Must Not Be Named. (Nothing original EVER came from that show, they took everything from elsewhere) It is a traditional children's song! That's all for this week. Next week, it's going to be all about bugs--especially caterpillars, some of whom should be coming to visit the library!